Not necessarily the end of the game, no; instead, this is The End. The End is the name of the Endermen's dimension. It's where the block theiving, teleporting, water-weak mobs call home. Moreover, it's the home of the brand new Enderdragon. We posted word of the Enderdragon towards the end of last week as Markus "Notch" Persson, Minecraft creator and Mojang developer, posted up a shot of his work on Twitter. Now, you may be thinking to yourselves, "that video has no Enderdragons or Endermen, what is this guy talking about!?" But, alas, someone on YouTube took to brightening the exceptionally brief clip and uploading it for our viewing pleasure. We give you a very bright version of The End. The darker, original version of the video also shows us what appears to be a brand new block type. The Endermen's home features some kind of strange, stone-sounding, green floor. 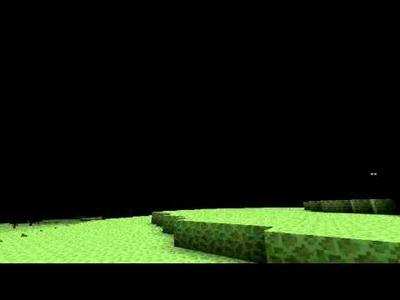 It looks almost like Notch took Netherrack, the most common block in the Nether, and made it green. See, this is why we loving being part of both the Minecraft experience and its community… we get excited over clips mere seconds long and too dark to register. And then we take to the Internet and feverishly search for answers to otherwise meaningless questions as we get excited over new block types and uniquely colored skies. Notch has not indicated if these additions will make it into the upcoming official release of Minecraft 1.9, so we'll go on guessing at every bit of news he drops until we know for sure when to expect this new world.